In the morning we went off to the Agra Fort with Abbib, a auto-rickshaw driver we had met the day before. 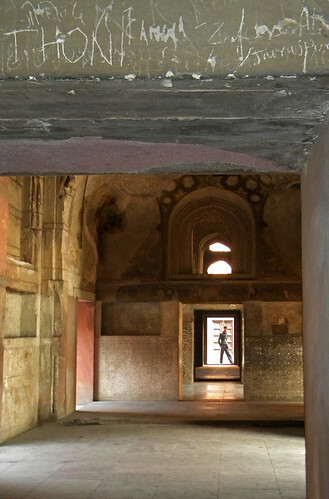 The Agra Fort, a 16th-century Mughal fortress, is another UNESCO World Heritage site in Agra, and in its own way is just as beautiful as the Taj Mahal. The ubiquitous monkeys were on hand to greet us as we entered. 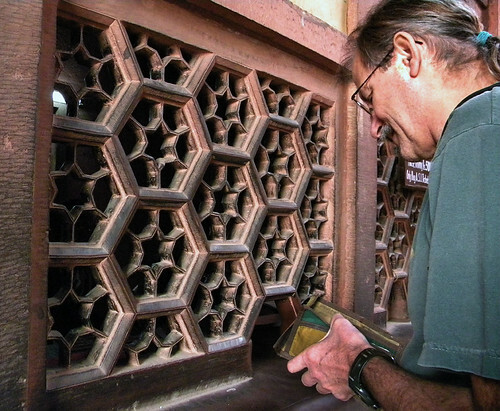 Al paying the entry fee; this was certainly a ‘classic’ sandstone cashier cage. 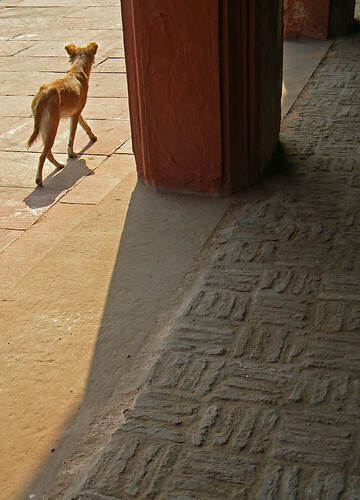 Stone collage, a common sight in India. 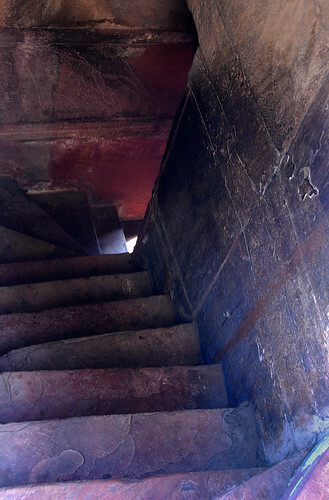 The stairway down. A guard keeping an eye out on the interior rooms of the fort. A stray dog casually wanders by. 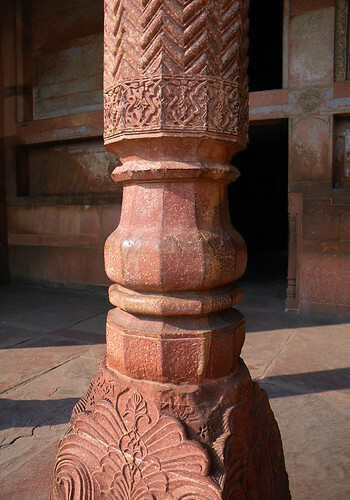 Carved sandstone columns. 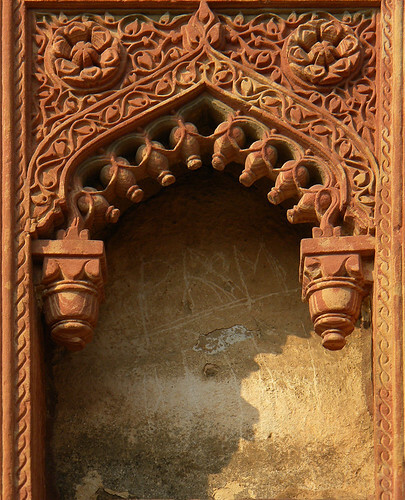 A niche with a frontispiece of elaborately carved red sandstone. 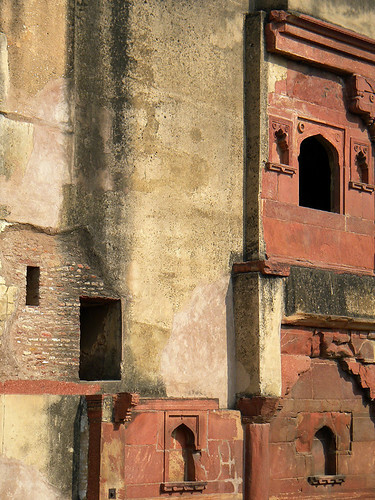 The red sandstone structures become increasingly intricate and beautiful. 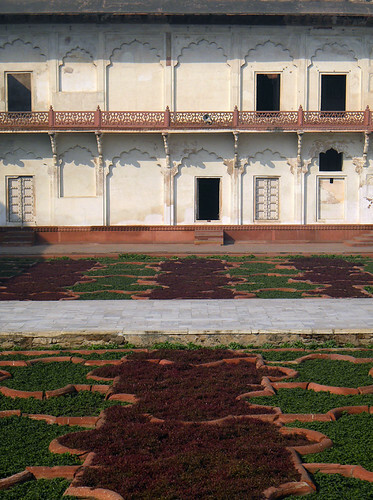 Within the fort is a marble palace that overlooks the formal garden. 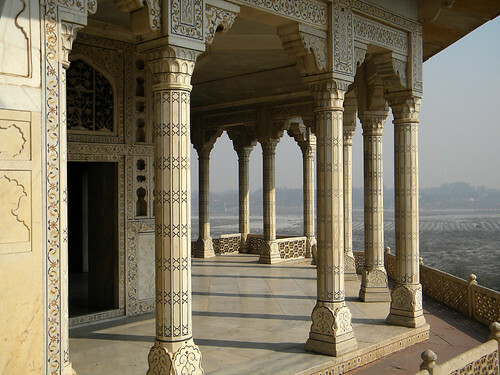 The marble balcony overlooking the surrounding lands. 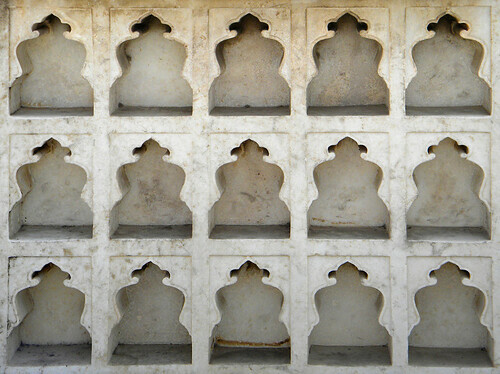 Niches in a marble wall. 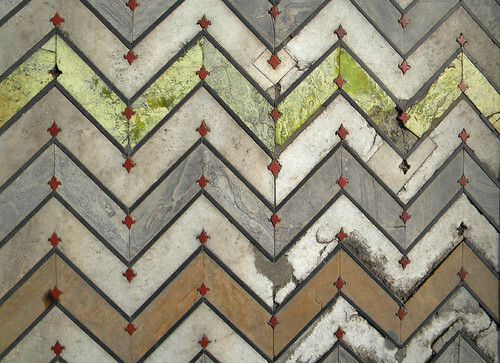 Geometric zig-zag patterns of semi-precious stones. 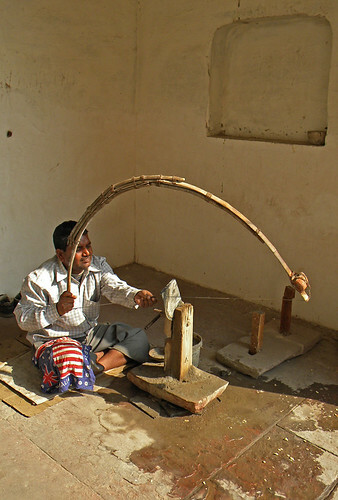 A primitive but surprisingly functional stone-cutting tool. The fort was large but we were unable to access its entirety there was a room of mirrors that I would have liked to have seen. Abbib was not waiting for us when we left so we hired a different driver, younger and ruder. “Aye Babu,” he yelled at an older driver just before he swerved suddenly to miss hitting a truck. At the bus station he demanded 70 plus 70. When Al tried to give him 100 he snatched at it and then grabbed “10 for a tip”. “No tip with all that nonsense,” Al roared and stomped off, leaving me shaking my head at him and then dashing off too. So now we were off on our next adventure, a bus trip to Fatehpur Sikri, the walled city created under the direction of Akbar, one of the greatest of Mughal emperors.